Incorporate Fripp techniques that help to persuade, inspire, Inform and get your rebooked. Every speaker novice or seasoned will find this session entertaining, thought-provoking, and content-rich presentation. You will learn specific techniques that will guarantee that both you and your presentations get the results you need. You will come to appreciate the focus on word choices, the amount of specificity, emotional connection, and clarity of the message. Willing volunteers will be invited to deliver a small portion of their presentations, and Patricia Fripp will add her laser-focused “mini” coaching. Companies who want a competitive edge hire Patricia Fripp. She is a Hall of Fame keynote speaker, executive speech coach, sales presentation skills and on-line training expert. 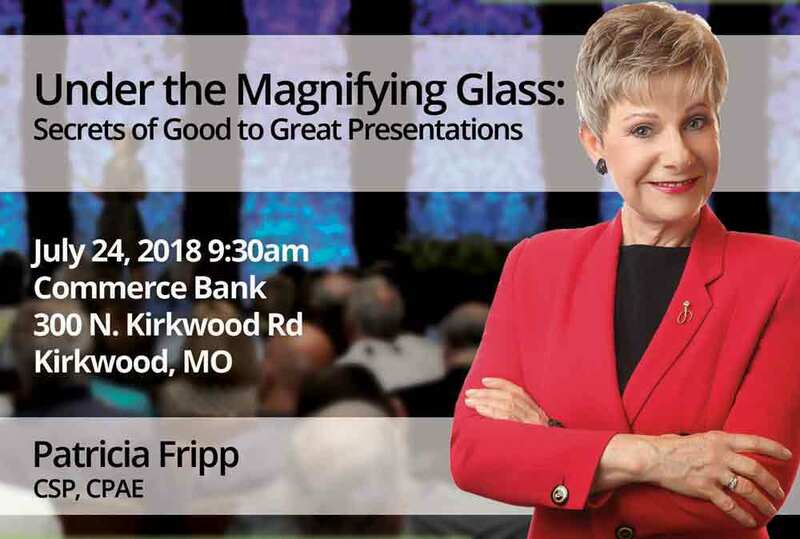 When your message must be memorable, your presentation powerful, and your sales successful in-person or online Patricia Fripp can help. Patricia was also NSA’s first woman president. She has won or been awarded the CSP, CPAE and Cavett award. Kiplinger’s Personal Finance wrote the sixth best way to invest in your future is to learn presentation skills from Patricia Fripp. Patricia can virtually train everyone in the world with her interactive online learning. To become a great speaker easily, conveniently and quickly you sign up for www.FrippVT. Why not sign up for your trial today?